Cleaner formulas featuring gold standard ingredients deliver even better results, with clinically tested performance. We’ve elevated our star ingredient, Vitamin C, with the introduction of Sustainable Orange Stem Cells to help improve the appearance of skin radiance, elasticity, firmness and texture while minimizing the appearance of wrinkles, revealing truly healthy-looking skin. Help reveal even-looking skin through exfoliation. Sea Buckthorn Ceramide our proprietary moisture barrier-protecting complex consisting of sea buckthorn oil and olive fruit oil, which are rich in omega fatty acids. Stabilized Vitamin C boosts and maintains moisture by supporting collagen, resulting in an improved appearance of fine lines while restoring a natural, youthful glow. Peptides enhance the appearance of skin smoothness, diminish the look of fine lines and wrinkles, as well as improve the appearance of skin tone, firmness, and suppleness by adding moisture. Brown Algae Extract helps diminish the appearance of fine lines and wrinkles by moisturizing the skin’s outer layer. Clinical study of 27 participants conducted over 30-day period. Results compared to baseline. So what would you rather put on your face? Before and after images feature Arbonne Independent Consultants. Images taken after 30 days of use of the new RE9 Advanced Collection. Clinical study of 28 participants. Results compared to baseline. Take the 30-day challenge for Great Skin and see the results for yourself! saw an improvement in radiance. showed an improvement in crow's feet. had improvement in skin elasticity. Clinical study of 28 participants using the RE9 Advanced Corrective Eye Cream and Intensive Renewal Serum. Results compared to baseline. *Clinical study of 28 participants using the RE9 Advanced Corrective Eye Cream. Results compared to baseline. *Clinical study of 28 participants using the RE9 Advanced Intensive Renewal Serum. Results compared to baseline. 79% saw an improvement in radiance. 79% showed an improvement in crow's feet. 100% had an improvement in skin elasticity. Offers gentle exfoliation of the skin’s surface thanks to alpha hydroxy acids, along with all-day hydration to help improve dryness and flakiness. This luxurious cream is formulated with red algae extract to help smooth the appearance of dimpled skin and promote a shapelier-looking silhouette. Restores the appearance of firmness through moisturization to support collagen and elastin, fighting the look of gravity for a firmer, tighter appearance of the décolletage and neck. Youthful-looking skin starts with clean skin. This pearlescent cream formula creates a light foam to gently wash away makeup and impurities. With an added plant-derived moisturizer, you can bet on starting your day with a refreshed, hydrated canvas. Set the right tone with a quick misting of this toner that helps minimize the appearance of pore size through added cleansing. Just a few spritzes or swipes over the skin help refresh the skin and enhance radiance by evening out the appearance of skin tone, preparing it for the next step. This super concentrated formula helps reduce the appearance of fine lines, balanced with a light, silky texture. Advanced peptides, antioxidants and essential botanicals work synergistically within the formula to hold in moisture and help enhance the look of skin smoothness and firmness. So good, your skin will never want to be without it. Pat this on gently around the eye area for deep hydration that locks in moisture to help reduce the look of fine lines and deep wrinkles. Caffeine helps diminish the appearance of puffiness and dark circles through hydration, while olive squalane provides moisturization to help nourish the delicate eye area for a youthful-looking glow. This non-SPF version provides loads of hydration thanks to hyaluronic acid that acts as a cushioning and lubrication agent to lock in moisture. This extra-hydrating cream for drier skin moisturizes deeply, supports collagen and protects skin’s youthful appearance. Sleep your way to beautiful skin. Formulated with an ultra-hydrating blend of botanicals, plus collagen supporting ingredients that replenish moisture and deliver essential nourishment to maximize the skin’s natural reparative cycle. Helps reduce the look of fine lines and deep wrinkles through moisturization — all while you sleep. Start your collection. Includes Smoothing Facial Cleanser, Regenerating Toner, Intensive Renewal Serum, Corrective Eye Cream, Night Repair Cream, and Restorative Cream Broad Spectrum SPF 20 Sunscreen #818; or with Extra Moisture Restorative Cream Broad Spectrum SPF 20 Sunscreen. You glow, girl. This mask gently exfoliates to visibly improve the appearance of skin tone and texture, minimize the look of pores, and provide a radiant glow. Here’s some uplifting news: Key ingredients in this advanced formula work immediately to make skin feel firm and look lifted. Maximize the application of our anti-aging skincare products. A proven revolution in pure, safe, beneficial™ anti-aging skincare, formulated to deliver youthful-looking skin. Experience the newest collection, upgraded with gold standard ingredients to support healthy-looking skin from head to toe. Cleaner formulas featuring gold standard ingredients which deliver even better results with clinically tested performance. How does the RE9 Advanced Collection work? The RE9 Advanced collection was developed to address the specific needs of aging skin. When used consistently as a twice-daily skincare regimen, the products are clinically tested to improve the appearance of skin firmness, elasticity and tone, minimize the appearance of fine lines and wrinkles, and improve hydration — helping the skin look visibly rejuvenated and youthful. How soon can I expect to see results from the RE9 Advanced Collection? *Based on a 4-week independent U.S. clinical study of 29 participants. Do I need to use all the steps in the RE9 Advanced Collection? Yes, to get optimal results, we recommend using all the products in the face collection. How long should I continue to use the RE9 Advanced Collection? Continue to use the RE9 Advanced Collection for the face as your daily regimen to maintain healthy, rejuvenated skin and to help prevent the appearance of lines and wrinkles, loss of firmness and elasticity, skin texture, and dehydrated skin. What are the benefits of the ingredients used in the face products for RE9 Advanced? Formulated with innovative botanical stem cell technology along with algae extract, peptides and botanicals, the products contain ingredients to provide clinically proven anti-aging benefits. Botanical stem cells obtained from oranges help improve the appearance of skin radiance, elasticity, firmness and texture while minimizing the appearance of wrinkles. Botanically based emulsifiers, surfactants and moisturizers support the delicate skin barrier by increasing hydration. Can I use RE9 Advanced if I am pregnant or nursing? Please consult with your doctor about the products before starting the regimen. Bring the ingredient lists with you to share with your doctor. What is the difference between the Restorative Cream options? All versions improve the appearance of fine lines, wrinkles, firmness and hydration and are suitable for all skin types. Restorative Cream (non-SPF) is ideal for those who are sensitive to sunscreens and who desire a more emollient day cream. Restorative Cream Broad Spectrum SPF 20 Sunscreen is ideal for those with normal to oilier skin types. Extra Moisture Restorative Cream Broad Spectrum SPF 20 Sunscreen is ideal for those who have drier skin types and/or desire a more emollient day cream with SPF. What is the RE9 recommended daily skincare regimen for optimal results? What are the differences between the new RE9 Advanced products and the original RE9 Advanced products? These new products are cleaner formulas featuring new gold standard ingredients, enhanced textures, superior performance, and sophisticated packaging design. The new products are now formulated without EDTA, PEGs, butylene glycol, orange oil, retinyl palmitate, polysorbate, and urea. We also added a completely new product to this line which is the RE9 Advanced Restorative Cream, a non-SPF day cream which is ultra-hydrating. Why are the new RE9 Advanced products unscented? Orange oil is a potential allergen which can cause sensitivity and irritation. We have therefore removed orange oil from the new facial products. Is RE9 Advanced appropriate for oily skin types? Yes, RE9 Advanced is suitable for all skin types. However, the new non-SPF Restorative Cream and Night Cream are rich, hydrating formulas. If your skin is oilier, select the Restorative Cream Broad Spectrum SPF 20 Sunscreen which is more suitable for normal to oily skin. Only use the night cream once a week and increase usage if needed. What are the new gold standard ingredients used in the new RE9 Advanced products? What changes were made for the new RE9 Advanced Smoothing Facial Cleanser? We removed the ingredients that were not compliant with our ingredient policy. The new cleanser formula contains gentle plant-derived surfactants and orange stem cells. While this is still a creamy cleanser, the new modern texture is lighter and easier to rinse off than the original cleanser and does not over-dry the skin. What changes were made for the new RE9 Advanced Intensive Renewal Serum? We removed the ingredients that were not compliant with our ingredient policy. The new cleaner formula now contains peptides to improve fine lines and wrinkles, our proprietary sea buckthorn ceramide complex, niacinamide, and orange stem cells. This new super-concentrated formula has a more modern texture with an improved after-feel on the skin which allows for easy layering of the day creams or night cream. This new improved texture makes it easy to use with the Genius Ultra. 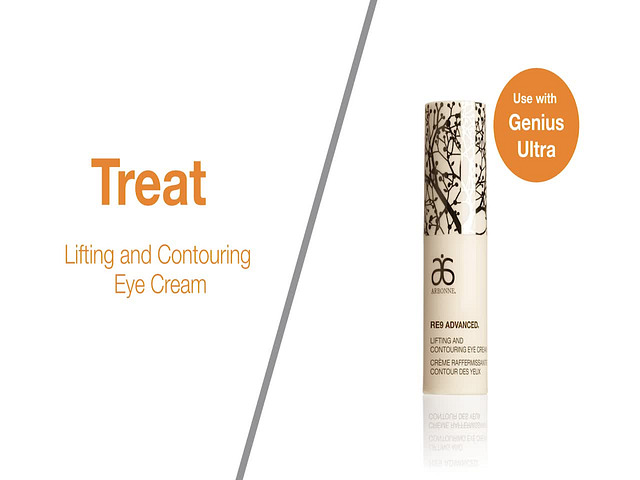 What changes were made for the new RE9 Advanced Corrective Eye Cream? We removed the ingredients that were not compliant with our ingredient policy. This new cleaner formula contains new peptides to improve fine lines and wrinkles as well as reduce the appearance of dark circles in the eye area. Other new ingredients include our proprietary sea buckthorn ceramide complex, orange stem cells, and olive squalane. This new improved formula has a creamy texture and glides on the skin easily making it easy to use with the Genius Ultra. Are the new products vegan and gluten-free? Can I still purchase the original RE9 Advanced facial products? Yes, these products are available while supplies last. Can I use RE9 Advanced if I have rosacea-prone skin? What is the pH of the new RE9 Advanced Smoothing Facial Cleanser? The cleanser is pH-balanced to normal healthy skin (pH = 4–6). Can the day creams be used around the eye area? Day Cream should not be used on or around the eye area. If the product is getting into the eyes, we would recommend that it be used further away from this area of the face, never below the eye brow within the orbital bone area. For moisturization in this area, we would only recommend using an eye cream which is formulated and tested to be safe for use in this area. Do any of the RE9 Advanced products contain chamomile? Chamomile is only present in the Restorative Cream Broad Spectrum SPF 20 Sunscreen. What ingredients in the RE9 Corrective Eye Cream address dark circle and puffiness? A blend of both caffeine and peptides visibly diminishes the appearance of puffiness and dark circles while improving the appearance of lines and wrinkles around the eye. Why weren’t the Extra Moisture and Restorative Broad Spectrum SPF 20 Sunscreens reformulated? We are currently in development with new mineral-only options. What does the 9 in RE9 stand for? When we first launched the RE9 collection, the 9 stood for 9 key anti-aging ingredients that we formulated the products with to help support the results. Today, with the launch of our most updated and advanced version of RE9 to date, our focus has shifted to using gold-standard anti-aging ingredients to help deliver the visibly powerful and amazing looking results. We have kept the name of the collection the same as a tribute to the product heritage as we always continue to honor the core culture of all Arbonne products.